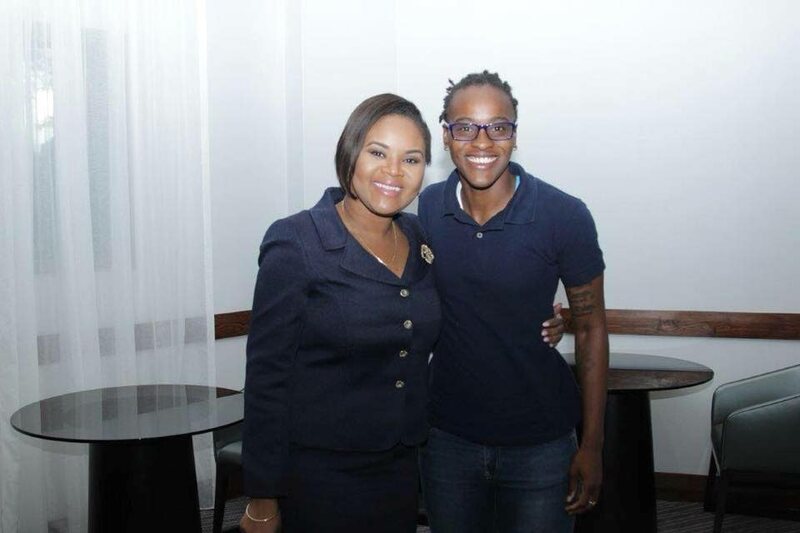 Shamfa Cudjoe, Minister of Sport and Youth Affairs (left) smiles after meeting national women’s football team goalkeeper Kimika Forbes at the Ministry’s office in St Clair on Tuesday. SHAMFA CUDJOE, Minister of Sport and Youth Affairs, has issued a warning to both the TT Football Association (TTFA) and the national women footballers that the recent scenario involving both parties must never happen again. Two members of the national team, Lauryn Hutchinson and Arin King, took to social media last week to plead for support for the team, ahead of the CONCACAF Women’s Championship in the United States from October 4-17. On Monday, the TTFA, in a media release, suggested team manager Jinelle James made a request to the Ministry for funds for an overseas camp, but James refuted that claim in a strongly-worded statement on Tuesday. Cudjoe, via a media release on Tuesday evening, announced that the Ministry will provide a sum of $430,000, the full amount requested via a proposal submitted by the TTFA. This financial assistance is intended to cover the costs of airfare, hotel accommodation, food and beverage, pre-training camp, medical and baggage fees, and other items, for the team and the technical support staff. This disclosure came hours after Cudjoe met with members of the team, including captain Tasha St Louis, goalkeeper Kimika Forbes, midfielder Janine Francois, striker Mariah Shade, defenders Ayanna Russell and Patrice Superville, at the Ministry’s office on St Clair Avenue, Port of Spain. The Sports Ministry’s media release noted, “(Cudjoe) was informed about the many challenges faced by the players, including the matter of outstanding retainer fees owed to the players by the TTFA. The TTFA will be invited to sign a Service Level Agreement (SLA) to ensure funds are properly disbursed and utilised, the media release added. Earlier on Tuesday, Cudjoe met with TTFA president David John-Williams, general secretary Justin Latapy-George and other TTFA members at the Ministry’s office to discuss the details of the proposal. “Cudjoe reminded the TTFA of the importance of proper planning, management, and leadership in the execution of its affairs, and further encouraged the TTFA to comply with the Ministry’s guidelines regarding the timely submission of financials, proposals, calendars and other relevant documents,” the Ministry’s release pointed out. Reply to "Women football saga must never happen again"